Andhra Pradesh is witnessing a `Chandranna mania' of sorts. 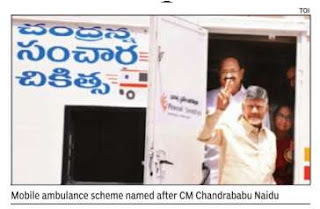 In what appears to be an attempt to project himself as a `messiah of the state,' chief minister Chandrababu Naidu is naming most government schemes programmes after himself. Seasoned politicians and analysts aver that no serving chief minister has resorted to this kind of exercise be fore. More than a dozen schemes have Chandranna tag now -the latest being `Chandranna Bheema' (insurance scheme for workers) unveiled on Sunday . This, in fact, goes against the TDP regime's tradition of naming all the government schemes after party's founder N T Rama Rao. With Chandranna tag carrying much we ight, only two schemes -NTR Aarogya Seva and NTR Bharosa -remain in the honour of the late CM. Naidu even outdid his Tamil Nadu counterpart Jayalalithaa, who dubs all welfare measures as ` Amma' schemes.“Naidu cannot call himself as Anna' either as the term is ` popularly referred to NTR. People used to revere NTR as ` Anna' and certainly not Naidu,“ pointed out a political observer.